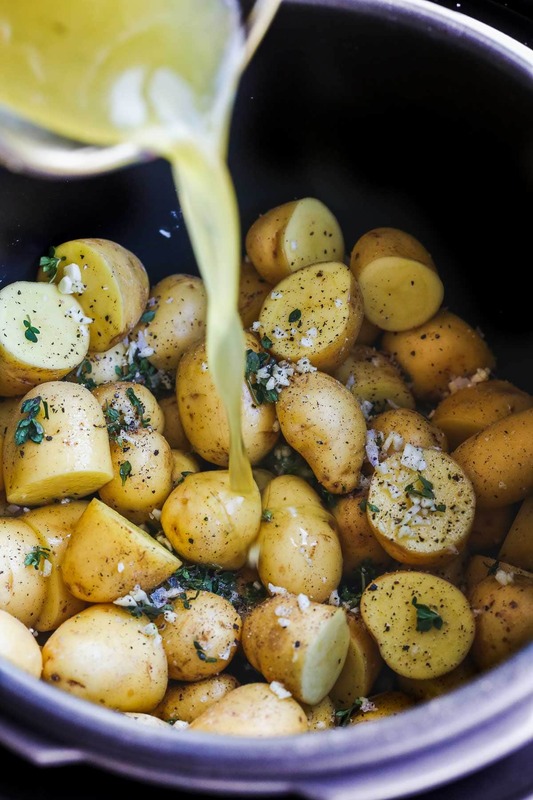 These Instant Pot potatoes are cooked to perfection with butter, herbs and garlic. Served with grated parmesan cheese and parsley. A wonderful side dish to go with any meal, and ready in just 20 minutes! 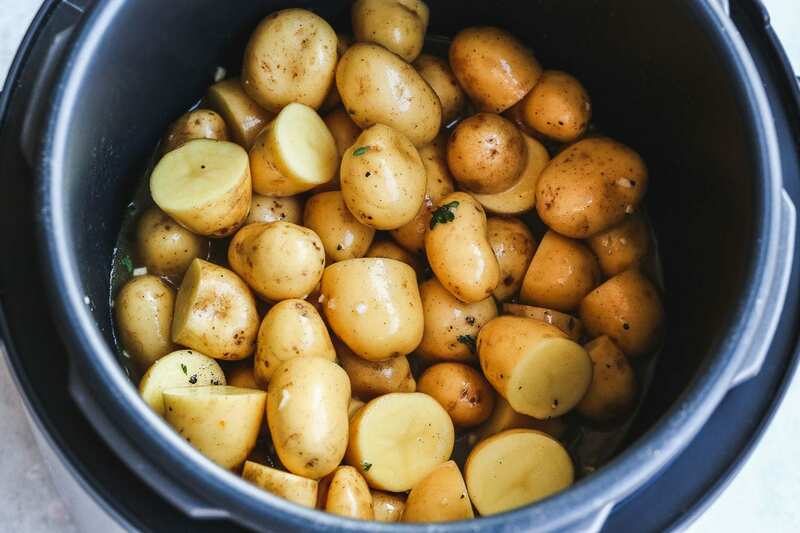 There so many different ways to cook potatoes in the Instant Pot, but this recipe is definitely my favorite! 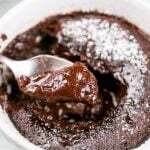 I love such recipes where very minimal effort is required, and you end up with a great tasting dish really quickly. 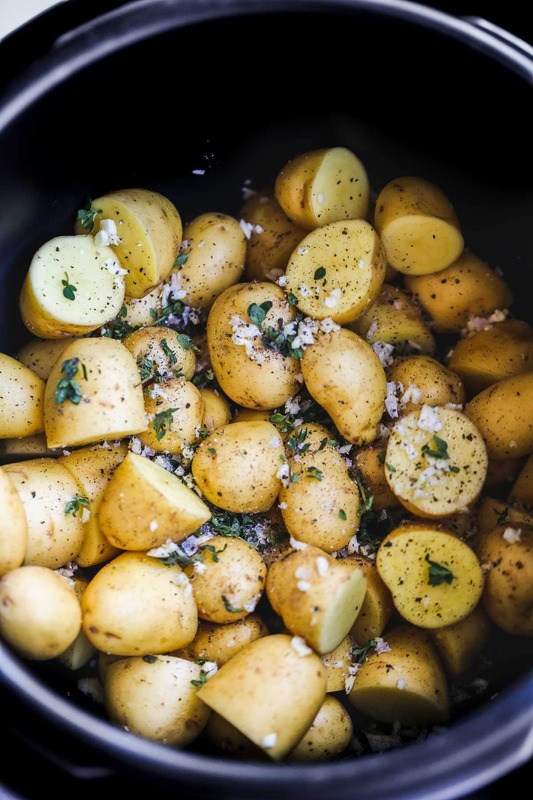 I make these Instant Pot roasted potatoes all the time. 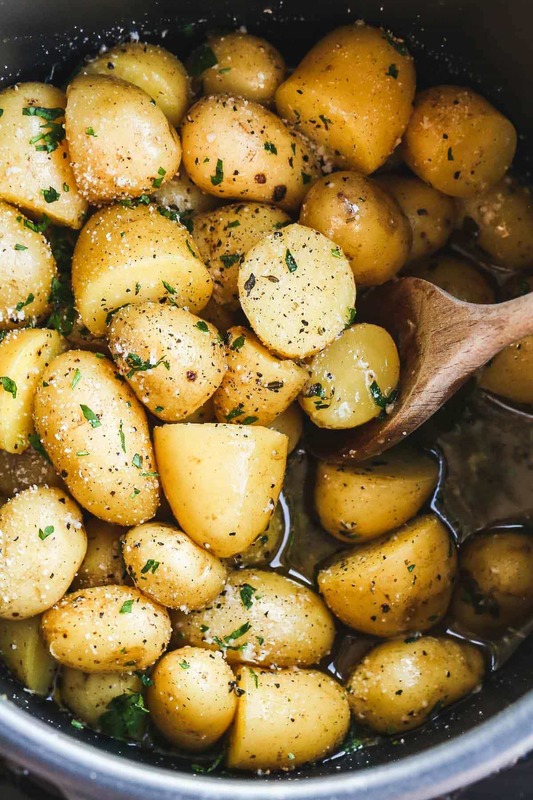 Actually, they’re not exactly roasted potatoes, they’re more like soft and buttery potatoes, that are so flavorful and delicious! Cooked with fresh garlic, herbs, and sprinkled with parmesan cheese and sea salt flakes. 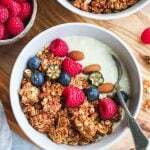 A bowl – I have this gorgeous mixing bowl that I use all the time! IKEA garlic press – the only garlic press that I will ever use. I’ve had this for over 5 years now and love it. Reliable, easy to use and wash and never breaks. Start by washing your potatoes, I use a vegetable brush to get rid of any dirt. Dry the potatoes and slice them with a knife, I leave the smaller new potatoes as a whole and cut the bigger ones in halves. Mince the garlic, chop the herbs and add them to the pot. Sprinkle with sea salt flakes. 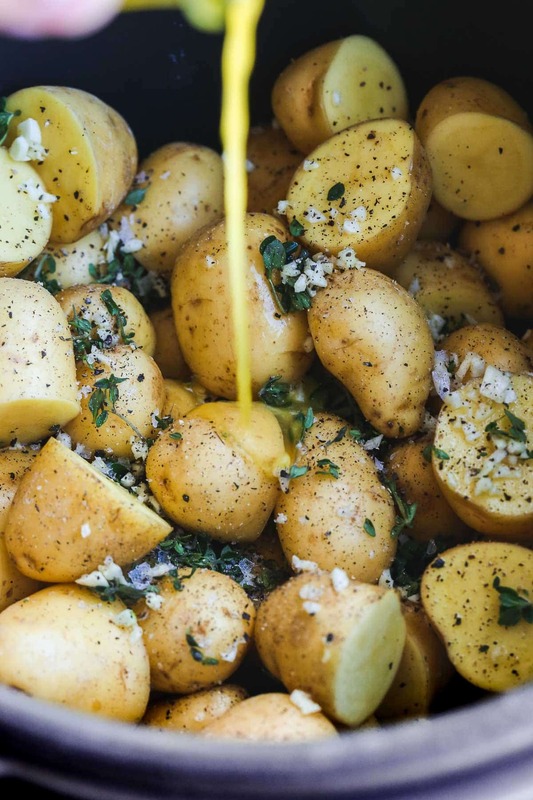 Melt the butter in the microwave in a small jar, and pour it over the potatoes. Add the vegetable broth, if you’re using a 6 quart Instant Pot or any other electric pressure cooker then you can use just 1/2 cup of broth although the minimum recommended amount is 1 cup. Stir the potatoes with the butter and the broth to make sure that the potatoes are well coated. Close the lid, and seal the IP. Cook on manual and select high pressure for 7 minutes. When the cooking is finished, do a quick release, unlock, remove the lid and serve! WHAT SIZE INSTANT POT IS NEEDED? 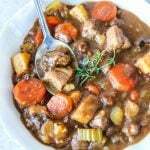 This recipe is tested in my wonderful 6 quart Instant Pot. If you’re using an 8 quart, you will need to use more liquid! 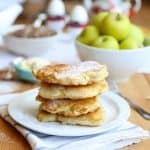 HOW CAN I MAKE A LARGE BATCH? I do this all the time! 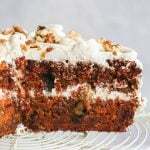 This recipe is perfect for dinner parties. I use the same amount of liquid and double the amount of the potatoes, cook on high pressure for 8 minutes, then leave the pot on “keep warm” until it’s time to serve the potatoes. And don’t forget to check out the rest of my Instant Pot recipes! Wash the potatoes, then cut them into halves (I don't cut the smaller ones and leave as a whole). Put them in the Instant Pot, then season them with herbs, garlic, pepper and salt. Add melted butter and vegetable broth. Seal the IP, click on manual then select high pressure and cook for 7 minutes. When the cooking is finished, do a quick release, unlock, remove the lid and serve. The recommended portion size is 180 grams (6 oz) of potatoes per person. Love Mac and Cheese? 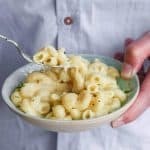 Try my super creamy Instant Pot Mac and Cheese recipe! I made these to go with a pot roast. They were very good. The flavors were perfectly blended and the potatoes were soft and fluffy. I highly recommend giving these a try. They will be my go to side dish for my pot roast from here on out. We all loved them. Sadly there were no left overs. I will have to double the recipe next time. 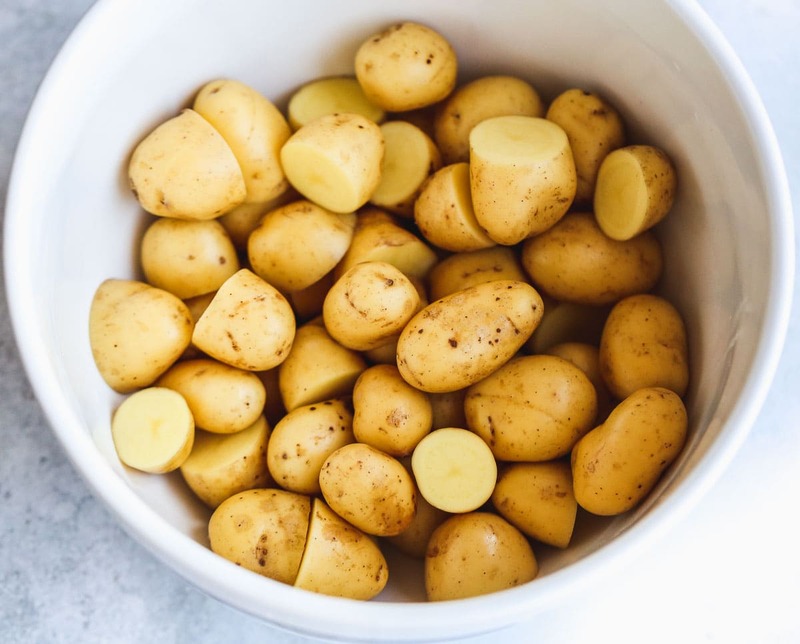 These potatoes look fantastic and I love that they’re made in the instant pot! You had me at potatoes!! This would be such a great side dish for a dinner party or BBQ! 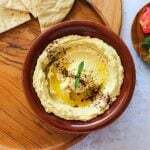 I love that you have done them in the instant pot, making this recipe so simple and easy. YUM!!! Yummy! Best way to cook potatoes and the result is impressive. 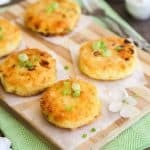 I am a potato lover and make them following your recipe details. I add lime juice at the end to add brightness.